How do you show your support and raise awareness for those affected by cancer? Awareness ribbons are a popular way to show your support for a specific type of cancer or disease. I have seen many people wearing pink Breast Cancer Awareness ribbons this month on t-shirts, jewelry, and keychains. As we begin to close on BC Awareness month, I began to wonder where awareness ribbons came from and how I could tie them into paracord. "The first ribbons were used as tokens that were given to knights during the middle ages in Europe. The yellow ribbon, commonly used to show that a family member serves i the military, came from the Puritan Army during the English Civil War, where it was then brought to the US. In the early 1970s, the song "Tie a Yellow Ribbon Round the Ole Oak Tree" was released, and based on this song, a wife of a hostage in Iran, Penney Laingen, was the first who used the ribbon as an awareness symbol. She tied yellow ribbons around trees, to illustrate desire for her husband coming home. Her friends and family members followed the trend. As many individuals were able to see this message, the "ribbon became a medium"
From that point on, the Awareness Ribbon spread to many different causes as a symbol of support and awareness. I have small wrists, so my bracelet will be about 6.5 inches in length. As a note, you will need about 1 foot of cord for every inch of your wrist. I like to use more cord than necessary so I don't run out. Run the cord through your buckle using a cow hitch knot and by looping through the other side. For this tutorial, I'm creating an awareness that uses the cobra weave. You can use different variations of the cobra weave if you want a thicker bracelet. If you're unsure of how to do the cobra weave, check out our video here. Weave until the bracelet is finished and melt the ends of the cord to keep it secure. You will want your ribbon to start toward the center of your bracelet, so that it will show on top of your wrist when the bracelet is worn. I have the Knotter's tool pointed to the center of my bracelet for reference. Use your knotter's tool to pull a hole into your cobra weave. This is to begin the weave of the awareness ribbon into the bracelet. Insert the cord through the hole, weaving it toward the back of your bracelet. Take the longer end of the cord and now weave it through the top of your bracelet, diagonal to where the weave first started. Loop the cord over and around the top of the bracelet to create the awareness ribbon. Cross cord over the weave and loop back through the bottom of the bracelet, diagonally from where the second weave of the top of the awareness ribbon lies. Cut and melt the ends of the awareness ribbon cord. Your awareness ribbon bracelet is complete! It's really that simple, folks. There are endless combinations to how you can create your awareness ribbon bracelet, from different color combinations, to patterns, to bracelet weaves, and more! Check out our full rainbow of colors here. 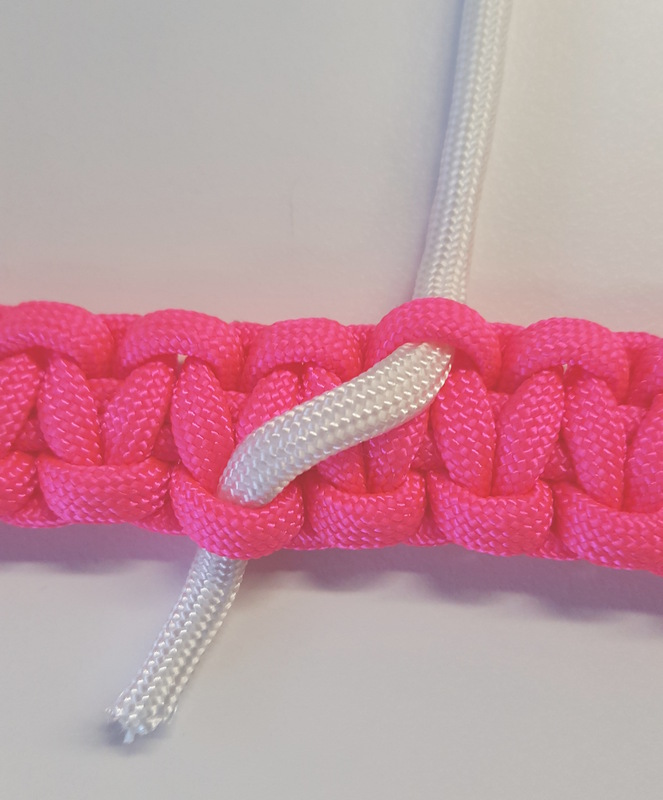 We also have a Youtube tutorial that shows you how to create a breast cancer awareness bracelet using paracord charms. Be sure to share your awareness ribbon bracelets with us on Facebook, Twitter, Instagram, Pinterest, Youtube, and Google+!